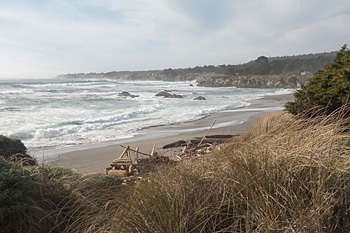 LX loudspeaker audition - Open House in Corte Madera - Saturday, April 27, 2019 --- 10 am to 2:30 pm. 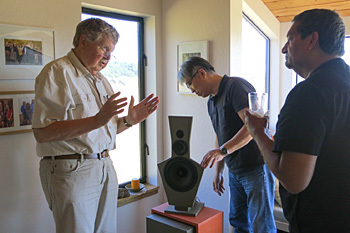 Eike Linkwitz invites you to an unique LX loudspeaker demonstration at the home of linkwitzlab in Corte Madera. Enjoy the realistic music presentation of LXsirius, LXsirius+2 , LX studio or LX521.4. Frank Brenner will be availabe for Q&As. I no longer sell directly any of my previously offered software or hardware products. I have retired. The Construction plans are required license to purchase parts kits and assembled systems. A 2-way loudspeaker that can be built for around $1200 including miniDSP 2x4HD equalizer/crossover and 4 power amplifiers in the 50 W to 200 W range. 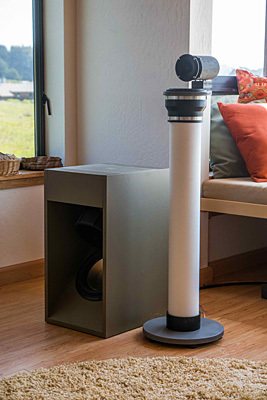 The speaker has a unique polar pattern, starting out as omni at low frequencies from the infinite transmission line woofer, going through a cardioid region around the 800 Hz crossover to an unbaffled, fullrange driver with dipolar behavior. Due to the low crossover frequency and acoustically close proximity of drivers the polar pattern is identical in vertical and horizontal directions, like in a coaxial design, but it has much wider dispersion at higher frequencies. The frequency range extends from 45 Hz to 20 kHz with 12 dB/octave roll-off at the low end. A 3-way loudspeaker that combines the LXmini with two, compact LXsub2 dipole woofers. It requires addition of two 50 W power amplifiers and a miniDSP 4x10HD unit to form a system that covers the 20 Hz to 20 kHz frequency range with excellent clarity and dynamism. With an LR2 crossover at a low 60 Hz the woofers can be placed against the side walls of a room and the LXmini used as near-field monitors. Path length differences to the listener can be compensated for in the DSP unit. 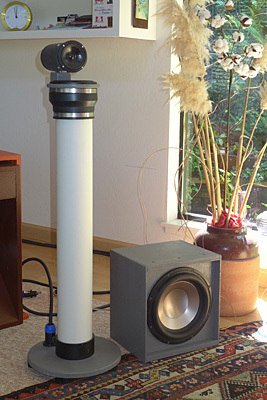 Dipole woofers have the advantage of less room mode excitation and thus preserve articulation in bass sounds. A 3-way loudspeaker that combines the LXmini with two LXsub4 dipole woofers, which have 10 dB higher output capability than the LXsub2. It requires addition of two 200 W or four 50 W power amplifiers and a miniDSP 4x10HD unit to form a system that covers the 20 Hz to 20 kHz frequency range with excellent clarity and dynamism. With an LR2 crossover at a low 60 Hz the woofers can be placed against the side walls of a room and the LXmini used as near-field monitors. Path length differences to the listener can be compensated for in the DSP unit. Dipole woofers have the advantage of less room mode excitation, which matters even in a highly damped recording/mixing studio. A 4-way loudspeaker, designed as full-range dipole, for flat on-axis and off-axis response in the horizontal plane and frontal hemisphere. It requires between 8 to10 power amplifiers of 50 W to 200 W and a miniDSP 4x10HD. The speakers need breathing room of at least 1 m to the nearest large reflecting surfaces and a room with a minimum floor size of 25 sqm. I consider each one of the four systems as state-of-the-art for rendering a convincing stereo illusion, that touches one's emotions, that is analytically revealing of flaws in the recording, yet at the same time forgiving them, if the art comes through. I therefore recommend building these speakers not only to the DIY community, but also to professional recording/mixing/mastering engineers and especially to the designers of consumer products to hear for themselves what they have been missing. Hopefully these designs inspire a fresh look at what is possible in terms of believable 3D from two speakers before everyone launches off into 3D over headphones with their unnatural distance distortion. For further details about these speaker systems, about ordering plans, construction materials, miniDSP and amplifiers, start with the LXmini, LXmini+2, LXstudio or LX521 page. See Terms & Conditions to guarantee that you receive a genuine LINKWITZ LAB product. That will take some effort on your part and I recommend to find a LXmini or LX521 owner in your corner of the world. 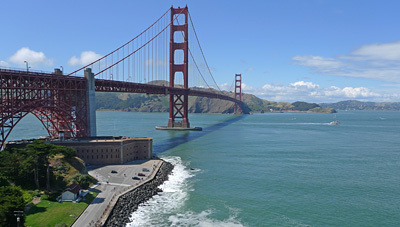 I have sent construction plans to many countries and www.magicLX521.com has shipped turnkey systems. I will not give out names or email addresses, but you could try to make contact via the OPLUG forum with one of the many DIY builders who frequent the forum. 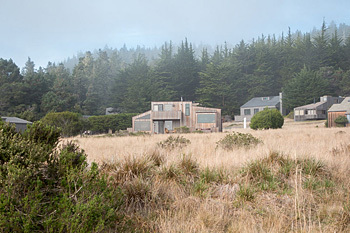 I have had Open House events to hear the loudspeakers here in Corte Madera and at The Sea Ranch earlier this year, but nothing is upcoming. I can assure you, though, that even if you have not heard LXmini or LX521 before making your decision, that you will be extremely delighted with their sound once you have built or acquired them. Either one will give you a completely new experience of your music collection. You are in for a treat. With these speakers you move to a new paradigm for stereo sound reproduction. Why is it so rarely heard? ... but you want to design your own loudspeaker? The LX521 loudspeakers are no longer alone in their ability to render in stereo a detailed 3D auditory scene with clarity, dynamism and neutral timbre for any kind of music. The LXmini, at smaller size and lower cost, is a close match to its bigger brother, except for lower maximum sound capability below 200 Hz and rolling off the bass below 45 Hz. While the LX521 needs at least a 25 m2 room and open space around it, the LXmini was designed to work well in any size room. The standard stereo triangle formed by loudspeakers and listener can be as small as 1 m for each side and be close to a wall. 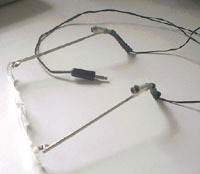 But unlike with headphones the auditory illusion is in front and stays there with head movement as is natural. Of course the size and distance to the auditory illusion increases with spreading out the triangle, limited only by the space available. The LXmini is easy to build. No soldering is required, just sawing, sanding, drilling holes, screwing parts together and crimping wire connections. The LXmini is in reach of every music lover! Few people have ever heard the detailed 3D rendering and realism that the stereo format is capable of when the loudspeakers are designed to illuminate the room evenly for all sounds and are properly set up in the room. The LX521 Reference Loudspeaker is an open-baffle, constant directivity radiator for the enjoyment of any type of music in the home and also for final judgment of work in the recording studio. The LX521 is designed to minimize the influence of the listening room upon the stereo image, which is formed in the listener's mind. The loudspeakers themselves disappear from aural perception, leaving in front of you a phantom acoustic scene to enjoy and study, and not just from the "sweet spot". Ultimately you are likely to get lost in the music. That is what I experience with a good recording. 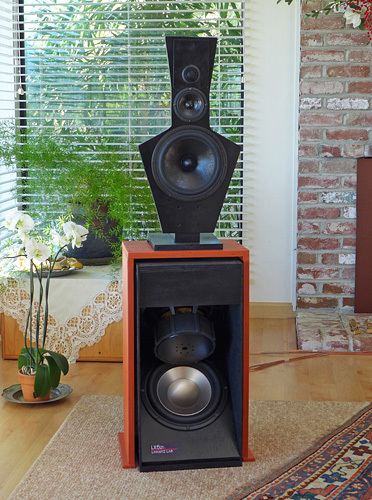 Most of my involvement with audio was about designing and building loudspeakers for my own use, for my own home. I have tried to push the state of the art, because I was never quite satisfied with commercial products, or could not afford what I liked at the time. I also discovered that even the best professional loudspeaker designers had unanswered questions and that I was not alone in my search. 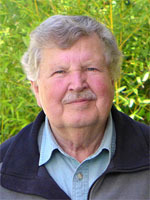 My education in electrical engineering, my work in electronic test equipment design and in microwaves had given me a good opening for designing broadband acoustic radiators that cover a range of wavelengths, which is equivalent to the range from 20 MHz to 20 GHz in electromagnetic terms. I have developed a deep appreciation of how the brain constructs an aural scene from the multiplicity of superimposed sound streams, which impinge upon each eardrum all the time. The brain's working suggests how to design a loudspeaker so that it can withdraw attention from the loudspeaker as the source of sound and the listening room as the real place, thus leaving an aural scene, an illusion floating in front of the listener. MAGIC is my other name for the LX521. In 2002 I put out the challenge to build yourself a high performance open-baffle loudspeaker system with electronic crossover/equalizer and multiple power amplifiers. The ORION incorporated what I had learned from designing loudspeakers for Audio Artistry and the follow-on PHOENIX. Soon after, Don Naples from Wood Artistry joined to supply precut wood parts and then complete, custom finished ORION systems. Today you can find hundreds of delighted ORION owners all over the world. The loudspeaker's design changed somewhat over the years. 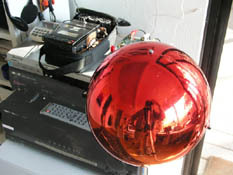 The midrange driver was mounted by its magnet. A rear tweeter was added. The frequency response was tweaked after hearing the first PLUTO. Don Barringer, a trained musician and former recording engineer with the US Marine Band, helped me in this process with many hours of listening. I am not touching the design anymore. The ORION has reached its full potential. PLUTO came about in 2005 after I had used its AURA tweeter as a small loudspeaker for low frequency room mode studies in a 10:1 scale model of my listening room. 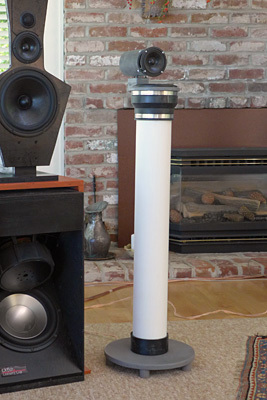 The tweeter opened the possibility of building a fairly decent omni-directional loudspeaker. I needed it as a reference source for studying baffle diffraction effects of the ORION. PLUTO evolved to the 2-way full-range loudspeaker that it is today when SEAS supplied me with a custom woofer/midrange driver. 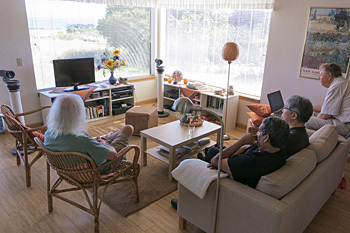 The loudspeaker is now ideally suited for smaller living spaces or as a lower cost alternative to ORION in larger rooms. PLUTO delivers great sound to hundreds of audiophiles worldwide, following ORION's example. 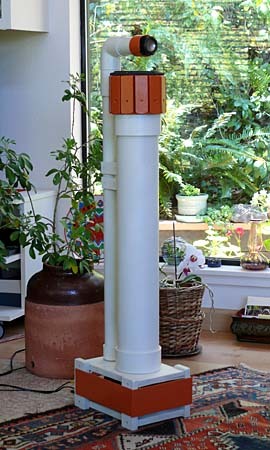 PLUTO-2.1 is a great father-son/daughter DIY project. The speaker has built-in power amplifiers, hooks up to the iPod or laptop and is easily moved. It provides an introduction to high quality sound. I launched this website in 1999 after I had separated from Audio Artistry. 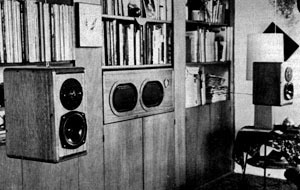 I left behind three proud design accomplishments: Vivaldi, Dvorak and Beethoven, all open-baffle loudspeakers. Much had been learned about loudspeaker design with passive and active crossover/equalizers. 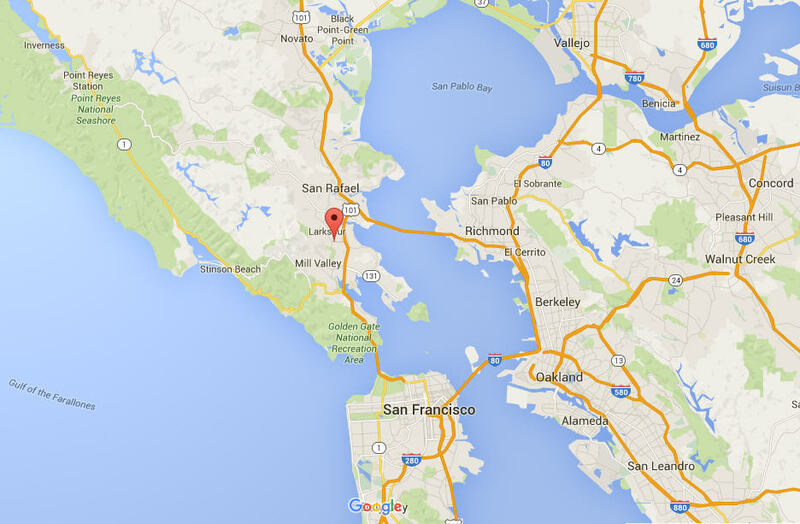 It added to what I had gathered from my audio hobby activities with other engineers at Hewlett-Packard Co. Especially Russ Riley, Lyman Miller and Brian Elliott had inspired me. So on leaving AA I wanted to write it all down, that it might benefit others and not get lost. The PHOENIX project was meant to be an illustrative exercise for others to judge the validity of what I was claiming. A study of the material will give you useful insight into the theory, design and construction of an open-baffle speaker, the necessary line-level crossover/equalizer and electronic filters. For the later ORION design I combined the separate dipole woofer with midrange and tweeter in a single cabinet. I also avoided the MTM driver arrangement. If you want to learn about the theory behind stereo, about what it takes to create a phantom acoustic scene between two loudspeakers in your living room, then read Stereo Recording and Rendering - 101. To get a taste of the large number of considerations that enter into the design of a loudspeaker you might read a ground breaking "Loudspeaker System Design" article. 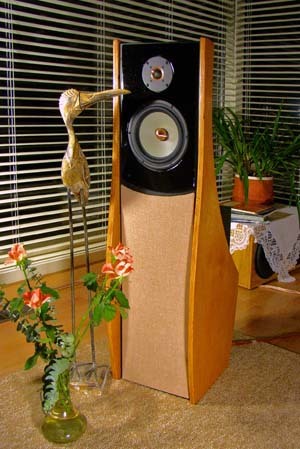 It was published 1978 in Wireless World magazine and describes a three-enclosure loudspeaker with active delay and crossovers using drivers that were highly regarded at the time, KEF T27, B110 and B139. 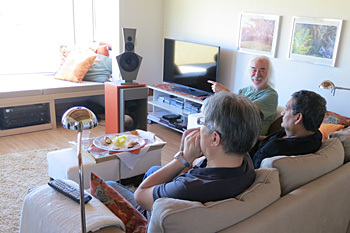 And then listen to a talk given 30 years later about accurate sound reproduction from two loudspeakers in a living room, to hear and see what more has been learned. 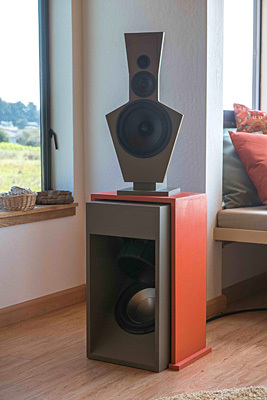 Or see my take on loudspeakers in 2013. On the Links and Other designs pages you will find relevant and interesting material. It will show you that there is still much to learn about the optimum configuration of loudspeaker, room, setup and recording in order to create a "realistic sound illusion". 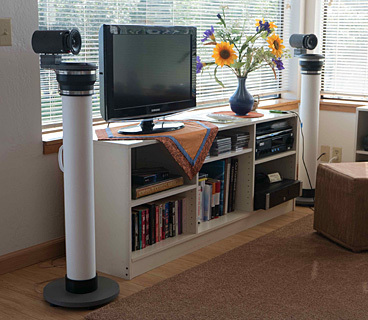 I offer recordings of useful test signals for room analysis and sound tracks to evaluate your loudspeakers. 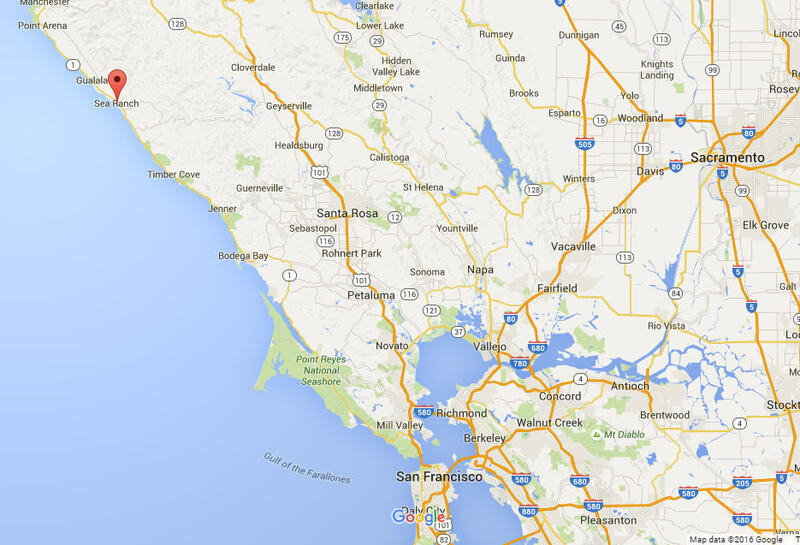 Look at the Site map to orient yourself when searching for specific information. 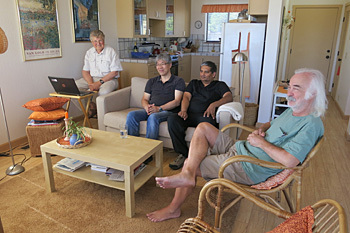 Check out the ORION/PLUTO/LX521 User Group for the exchange of ideas, for questions about LX521, ORION and PLUTO and to make contact with owners. You have come to a website with a wealth of useful and practical information about loudspeaker design, electro-acoustic system design and about perception of sound from loudspeakers in normal rooms. I have been active in this field for over 40 years, motivated by my love for music and by a keen interest in the difficulties of reproducing music realistically in the home. After retiring from Hewlett-Packard Co. (now 'Agilent') with 37 years in R&D of radio-frequency and microwave electronic test equipment, I pursued my investigation of the loudspeaker-room-listener interaction with refreshed energy and time. 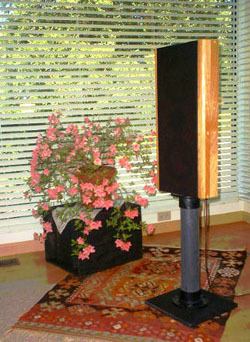 In the late nineties I had developed the Beethoven/Dvorak/Vivaldi line of open-baffle loudspeakers for Audio Artistry. My objective has always been the development of cost effective loudspeaker systems for two-channel sound playback of the highest accuracy. Occasionally I experiment with surround sound. Video sound and moving pictures are of low interest to me, but digital photography has rekindled my lifelong fascination with pictorial expression. On this site you will find the essence of what I have learned from designing, building and listening to many different types of speakers. Fortunately, I was rarely bound by commercial considerations or restricted by market expectations. I was free to search for the parameters that are truly important to realistic reproduction. Throughout this search, my sonic reference has always been the non-amplified original performance. My motto has always been to be "true to the original, as it was recorded". 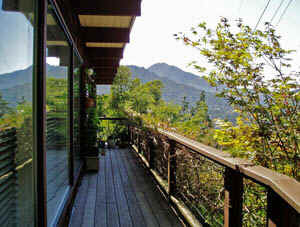 I want to reproduce a recording without adding or subtracting from it either because of the loudspeakers or the room. The recording then defines the possible realism of the auditory scene. On this website you find information that allows you to build, to purchase, or to design loudspeakers which exemplify the pursuit of realistic rendering. Check out the topics that are listed in the column on the left hand side of this page. I hope that the material presented here will add to your understanding of what is necessary for accurate sound reproduction. Regrettably, much misinformation and outright nonsense has been published to promote certain "high-end" audio products. The power of suggestion works exceedingly well, when listeners do not trust their own hearing. I recommend to re-calibrate yourself frequently. Listen closely to all sorts of non-amplified sounds in order to recognize and remember natural sonic scenes. Without a reality based mental reference it becomes an endless and futile pursuit to listen for differences between speakers and equipment in order to find the least falsification and a believable illusion of live sound and space. From where and in what numbers do visitors come to this website?